This is the story of Jamie, Peter Pan's first and most loved Lost Boy, Peter's best friend and eternal playmate. It's also a story about how love can turn to hatred, and how the best of friends can end up as the worst of enemies, and fair warning, it's not a tale for the faint-hearted. The Peter Pan we meet in this book is not a nice boy. In fact, it's fair to say he's one of most horrid and reprehensible assholes you're ever likely to meet. This is a Peter who not only never grows up but also never shows an ounce of compassion for those around him. Peter only cares about Peter, and even his professed love for Jamie is nothing more than a self-serving need to be the centre of attention. The boys on the island are there for Peter's fun and Peter's alone, even if that means getting the boys killed in one of his many games. Trying desperately to act as a foil to Peter's selfishness, Jamie makes it his duty to care for the boys and take care of them when Peter won't. Unfortunately, even Jamie can only do so much, and over the course of the narrative more and more boys fall prey to Peter's lack of consideration. And gradually, Jamie's love of Peter fades and is replaced by first resentment, and eventually by hatred. The covers for the American edition of this book make it plain with a blurb that this is the story of how Captain Hook became the man he is, and I think that's a bit of a shame. Yes, anyone with even a basic understanding of the Peter Pan story will know that Captain Hook's first name is James, but maybe it would have been better to let the reader work out the maybe-twist for themselves. Even so, I really liked the story. It's paced so well, and while not as dark as Christina Henry's Alice and Red Queen it still has enough darkness to make the reader shiver, especially in Peter's meltdown in the final few chapters. If you like modern retellings of classic stories then I'd recommend giving this one a chance, and if you haven't yet read any of the author's other works then check them out as well. Just be aware that they are very dark and not for the squeamish. 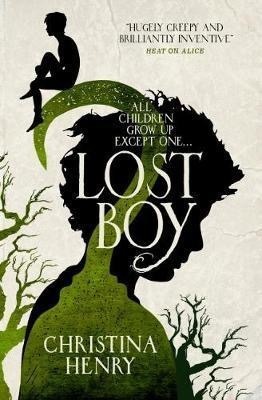 Sign into Goodreads to see if any of your friends have read Lost Boy.